The CM15A2Z is a brain transplant for the original, through-hole CM15A which uses a 1.500" X 1.250" carrier board holding an Arduino Mini Pro ATmega328 5V 16M (which has been brainwashed and re-educated to become a generic ZBasic device). The carrier board also includes a CH340G USB-Serial converter, a Micrel MICRF008 wideband scanning superheterodyne RF receiver (with socketed ceramic resonator) and ST M41T81S RTC1 ICs as well as a socket for a SAW controlled RF transmitter. 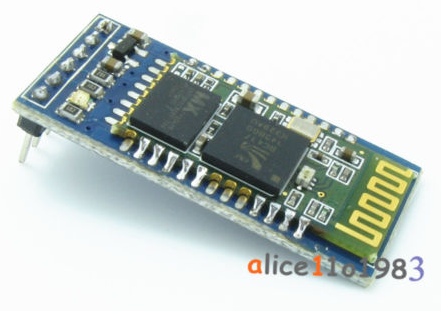 This combination replaces the Cypress CY7C83723 microcontroller, RF receiver & RF transmitter used in the CM15A. The RF receiving antenna is replaced with a 50-ohm BNC coax connector. Circuitry allows for powering an antenna amplifier over the coax. The CM15A2Z provides access to all of the CM15A capability - X-10 PLC send/receive, RF send/receive as well as a 64KB EEPROM (replacing the 8KB EEPROM on the CM15A PCB). It will report all X10 PLC activity (in realtime) and all X-10 RF (standard, camera and security). 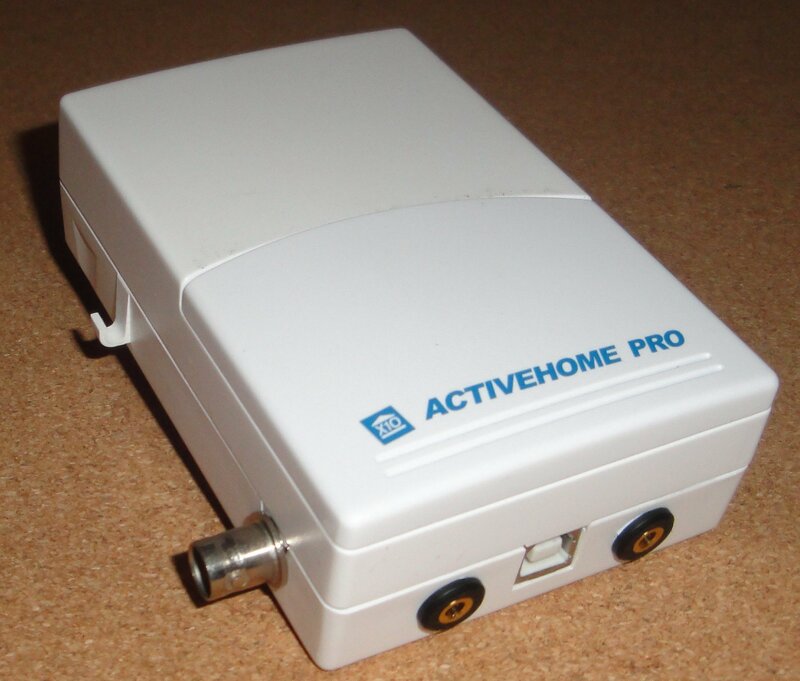 It can send user defined bitstreams either as PLC or RF. The RTC logs time/date of any power down, reporting the total time down at the next power-up. The CM15A2Z incorporates a ZBasic bootloader allowing firmware updates via the highspeed USB link. We will also publish the Communications Protocol. 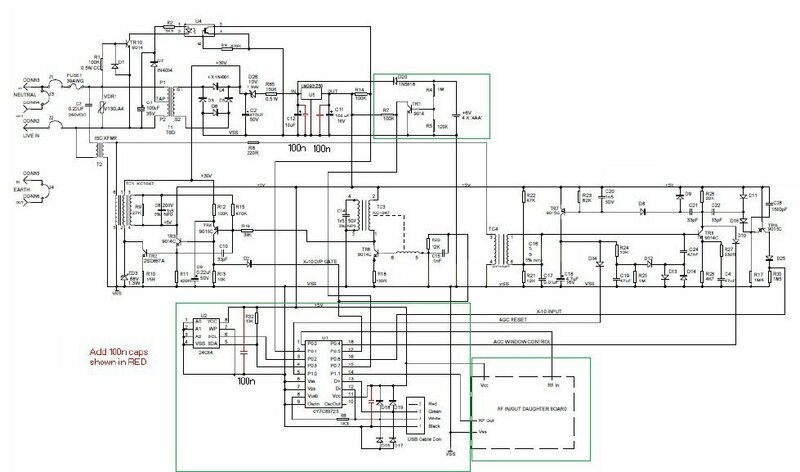 NOTE: Any 9600bps (or slower) serial device2 can use the serial ports which are tolerant of 5V-RS232 voltages but 3V3 devices require voltage conversion. RF range can be improved with a more efficient antenna which will be available in amplified and non-amplified versions (minimal assembly required). NOTE: The CM15A2Z will not work with existing X10 software but Windows, Linux, OSX, Android, iOS and ??? interfaces are planned using NSBasic. Code for all interfaces will be open source. Code for the firmware will also be open source but will require a ZBasic Generic Target License to download to the ATmega328 after modifying. For removing the Cypress CY7C83723 and the 8KB EEPROM, this desoldering iron works wonders, even for neophytes. The original CM15A schematic is shown below. The circuitry within the green boxes will be replaced or modified during our brain transplant surgery. Once we have a working prototype we will publish a step-by-step How-To, with pretty pictures, as an Instructable. For those more comfortable in the Arduino universe, the carrier board can be supplied with a non-brainwashed Arduino Mini Pro ATmega328 5V 16M (without any firmware). We will provide details on the AGC signals so that Arduino X10 sketches can be modified to support AGC. 1Two 1.5V AAA lithium batteries will maintain the RTC for 20+ years in the absence of power and the M41T81 signals when its batteries need to be replaced. It also records the time/date at any loss of power - at power-up, we use that to calculate downtime. 2Such as a lengthy RS232 link. Copyright: No part may be reproduced except as authorized by written permission. This restriction extends to reproduction in all media.